2- Tajin: a mix of sea salt, chili and desiccated lime. Makes the dullest food taste amazing with a slight pop and a lime aftertaste. All natural. Cost $1 more of less. 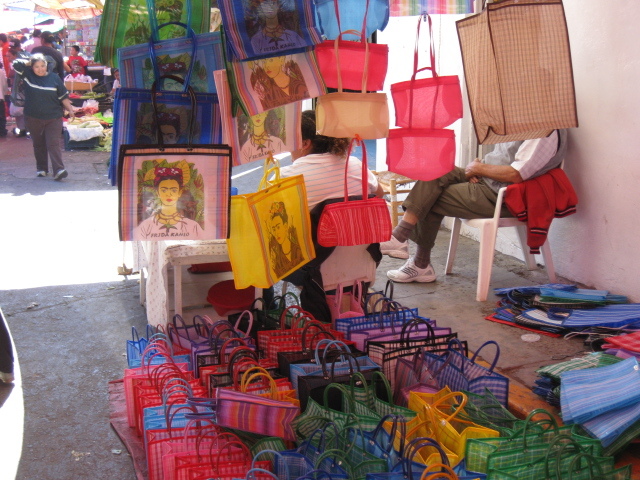 3-Frida Kahlo plastic bags: these carry-alls are adorable, come in bright colors and vibrant plastics. Cost: $4-5 and less in the Sunday market. 4- Seed pearls in natural or colored strands, sold in the daily street market near the hotel. Cost: $10? 5- Clunky glass beads in many colors including those twisted with a gold filament. Cost: $10 ish. Any or all of these are loved by my pals. So if you do join our discount group Feb. 9-16 2014, I will take you around to find these goodies. Most of our group going is solo, so don’t hesitate if you plan on coming along but without a friend. See more on our site including Vietnam/Cambodia.